Tin Can Tourists in De Soto Park, December 1920. Photos via Florida Memory. Long before today’s #vanlife movement, another generation of travelers and wanderers who carried their houses around with them put down some roots, so to say, as the Tin Can Tourists, a group that celebrates 100 years of “autocamping” this year. Even after Ford’s Model T put many Americans on the road starting in 1908, those roads remained unpaved messes, prompting Carl Fisher and other likeminded entrepreneurs to start instigating for paved highways criss-crossing the country. One of those, Fisher’s Dixie Highway, connected the Midwest to Florida and made seasonal long-distance vacation travel possible for middle-class motorists. The highway might have beckoned those travelers, but it didn’t always provide for them. A one-way trip from Michigan to Florida could take two weeks or longer, and none of the amenities modern travelers rely on — the first motel didn’t open until 1925, and they sure as heck didn’t have roadside plazas with restrooms and chain restaurants — existed at the time. Motorists of means had pioneered autocamping years before. One of the du Ponts built a self-contained Stoddard-Dayton in 1911, and the Recreation Vehicle Industry Association dates the first RV to 1910 on a Pierce-Arrow chassis, though railroad tycoon W. Gould Brokaw commissioned similar vehicles as early as 1906. But these new travelers weren’t having coachbuilders outfit their Model Ts, and in many cases weren’t living self-contained at all, preferring instead to pitch wherever they ended up for the night and roasting a can of beans over a campfire. “There were at that time no worth-while highways or camps and the tourists after a hard days drive of some forty or fifty miles often had to spend the night by the lonely roadside,” according to the Tin Can Tourists website. Municipalities generally allowed autocampers to stay for free in their city parks at the time, though local businesses — mostly local hotels — often objected, deriding the practice as unsanitary, unsavory, and a nuisance. Campgrounds began to spring up here and there to cater to the autocampers, though the rules for campers often differed from facility to facility. What the autocampers needed, they reasoned, was a sort of community to help other autocampers travel along the newly created highways and find friendly, clean, and safe places to stay as well as easily navigable routes. 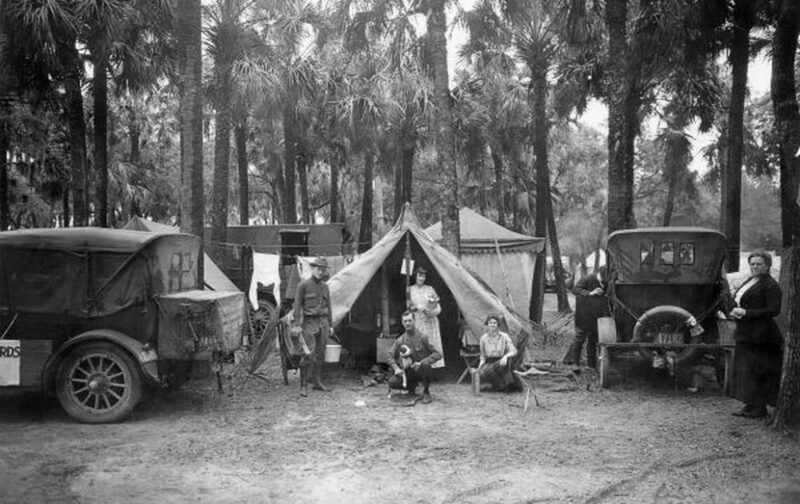 So in December 1919, about 20 autocampers, gathered by Chicagoan James M. Morrison, formed the Tin Can Tourists in De Soto Park near Tampa, Florida, taking their name from the tin cans out of which they ate. 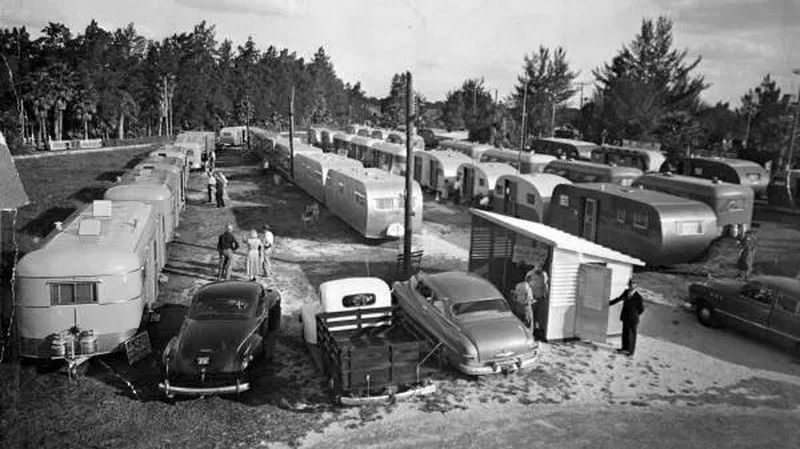 At first, the TCT hosted only annual winter meetings, first in Tampa and later in Arcadia, Florida, though as autocamping became more popular during the Twenties and Thirties — buoyed by the introduction of mass-produced travel trailers and the increasing tendency for travelers to eschew their fixed homes for a more nomadic lifestyle in often homebuilt housecars — the club introduced summertime meetings in the north as well. Eventually, membership in the Tin Can Tourists swelled to more than 100,000, prompting communities in Florida to vie among themselves for the privilege of hosting the club’s winter meetings. Tampa, which more or less ejected the group in the mid-Twenties, lured the Tin Can Tourists back in the late Thirties with a five-year hosting deal and a new municipal park built just for the club’s members. Contemporary trailer manufacturers even displayed their products at Tin Can Tourists rallies. Dealer showcase at the 1949 Tin Can Tourists gathering in Tampa, Florida. By the onset of World War II, the club’s membership started to decline due to competition from a rival group, the Automobile Tourists Association, and due to the changing landscape for travelers. Motels had become commonplace, as had roadside service stations and restaurants. The roads themselves had become more prevalent and easier to navigate. Campgrounds became self-regulating and less associated with itinerants. The club faded out in the Sixties, then dwindled to just a few members before folding sometime in the mid-1980s. Since then, the resurrected Tin Can Tourists has grown to about 2,000 members and spread across the country, though it still hosts sizeable rallies in Michigan and Florida. Perhaps the largest of the rallies, the Michigan Tin Can Tourists Centennial Celebration will take place May 14 to 19 at Camp Dearborn in Milford, Michigan, while a later rally will take place June 17 to 24 near Traverse City, Michigan. For more information on the Tin Can Tourists, visit TinCanTourists.com.